The U.S. administration began to deliver on President Donald Trump’s campaign promise to crack down on a work visa program that channels thousands of skilled overseas workers to companies across the technology industry. Fed up with a program it says favors foreign workers at the expense of Americans, the Trump administration rolled out a trio of policy shifts. The U.S. Citizenship and Immigration Services agency on Friday made it harder for companies to bring overseas tech workers to the U.S. using the H-1B work visa. On Monday, the agency issued a memo laying out new measures to combat what it called "fraud and abuse" in the program. The Justice Department also warned employers applying for the visas not to discriminate against U.S. workers. Trump campaigned on a promise to overhaul the immigration system, calling for companies to hire more Americans instead of outsourcing jobs to countries with cheaper labor or bringing in lower-paid foreign workers. Silicon Valley’s biggest tech companies, many of which were founded or run by immigrants, depend on H-1Bs and say efforts to thwart immigration threaten innovation, recruitment and startup formation. Trump’s executive orders restricting travel from a handful of Muslim-majority nations led to unprecedented opposition from the industry. But there’s also broad recognition that reform is needed, given several high-profile examples where American employees have been replaced by lower-paid foreign workers through the program. Advocates for immigrants’ rights also argue H-1B workers are easily exploited because their legal status is tied to a particular employer. The Economic Policy Institute estimated there were about 460,000 people working on H-1B visas in 2013. This week’s moves weren’t the administration’s first attempts to adjust the program. Last month, the immigration department suspended a system that expedited visa processing for certain skilled workers who paid extra. But people who have been pushing for reform had become frustrated in recent weeks that the Trump administration wasn’t moving fast enough. Outsourcing firms are considered the worst abusers of the system, an impression that the tech industry has been happy to encourage. Monday’s USCIS announcement targets those firms, with the agency saying it will focus inspections on workplaces with the largest percentage of H-1B workers, and those with employees who do IT work for other companies. Shares of Cognizant Technology Solutions Corp., Infosys Ltd., Wipro Ltd. and Accenture Plc each slipped more than 1 percent on Monday. Microsoft Corp., Facebook Inc., Alphabet Inc., Cognizant, Wipro and Accenture didn’t respond to requests to comment. Infosys declined to comment, while Tata Consulting Services Ltd. said it has reduced use of high-skilled H-1B visas, while creating more U.S. IT services jobs. The new guidelines released Friday require additional information for computer programmers applying for H-1B visas to prove the jobs are complicated and require more advanced knowledge and experience. It’s effective immediately, so it will change how companies apply for the visas in an annual lottery process that begins Monday. The changes don’t explicitly prohibit applications for a specific type of job. Instead, they bring more scrutiny to those for computer programmers doing the simplest jobs. "This is a step in the right direction in terms of tightening up the eligibility," said Ron Hira, an associate professor at Howard University, who has done extensive research on the H-1B program. "You’re going to have to beef up your argument for why you need this person." Technology and outsourcing companies are the heaviest users of the H-1B visa, which is the largest program for temporary foreign workers in the U.S. by a wide margin. India-based outsourcing companies receive a disproportionate percentage of the visas and tend to pay lower salaries than U.S.-based tech firms. 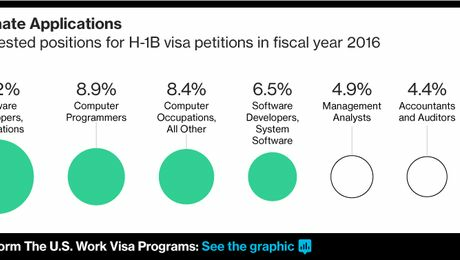 Employers sought H-1B visas for more than 13,000 computer programmers in 2016, citing an average salary of about $72,000, according to Bloomberg Intelligence analyst Caitlin Webber. About half of the visas sought last year were for computer-related positions, she said. Computer programmers made up about 12 percent of all H-1B applications certified by the Department of Labor in 2015. Of those, 41 percent were for positions at the lowest wage level, defined as jobs requiring people to perform routine tasks that require them to exercise little judgment on their own. The guidelines issued Friday refer specifically to entry-level computer programmers, which the U.S. Department of Labor defines as those who write and test code to allow computer applications and software to work properly. “This is not a change in policy on H-1B and H-1B1 eligibility in computer-related fields,” CeCe Gwathmey, a spokeswoman for the immigration agency, said in an email, referencing the March 31 document. The memorandum rescinded a 17-year-old set of guidelines that “relied on obsolete information and had not been used as a standard” to decide on H-1B petitions for many years, she said. Still, the administration hasn’t thrown its lot in with any of the plans for broader changes to the program. Lawmakers from both parties have introduced several bills this year. One would replace the current random lottery with a system that gives priority to companies paying higher salaries. Another would explicitly prohibit companies from replacing qualified U.S. workers with H-1B workers. Scott Corley, executive director Compete America, a coalition of employers that rely on high-skilled immigrants, said in a statement Monday that H-1B reform should be part of a broader re-assessment of the country’s immigration priorities. “Our nation’s outdated legal immigration system relies heavily on a single temporary visa category, the H-1B, to prove work authorization for every kind of high-skilled foreign professional we recruit,” he said. Previous articleWe surveyed 112 Puerto Rican funeral homes to check the accuracy of the hurricane death toll. This is what we found.